Tommy Lee, lengendary drummer and founder of the rock band Motley Crew, came to Los Cabos for a 5-day vacation, staying at Villa de Los Suenos in the Pedregal of Cabo San Lucas. He spent the day on the beach at the Los Cerritos Beach Club on Thursday, December 17, with his female companion and son from Pamela Anderson, Brandon. The entire group enjoyed the beautiful beach, rode ATV’s, and went on sky rides with local Robert Quirk, seeing the Pescadero area and pods of whales from the air. Tommy Lee preparing for a sky ride to see the whales and local area from the air. 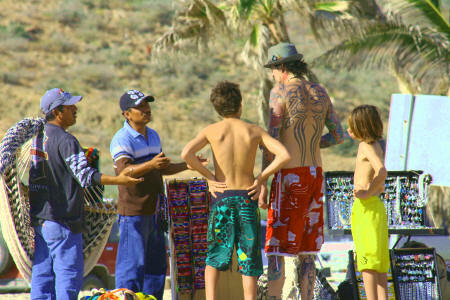 Tommy Lee and his family went on sky rides with local surfer and pilot Robert Quirk at the Los Cerritos Beach Club. The female companion and son of Tommy Lee also went for sky rides.